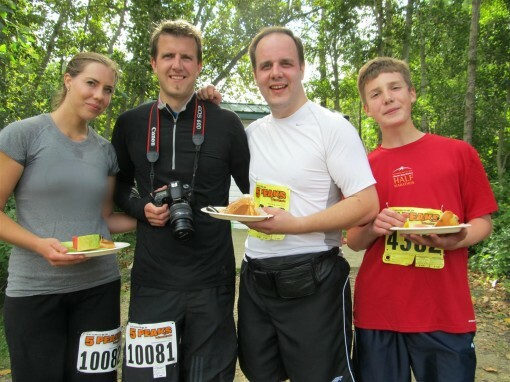 My First Trail Run was posted on August 27th, 2012 and is filed under Fitness, Running. This entry has 19 comments. You can follow any responses through the RSS 2.0 Comment Feed. So this Saturday I ran my first trail run (14k). 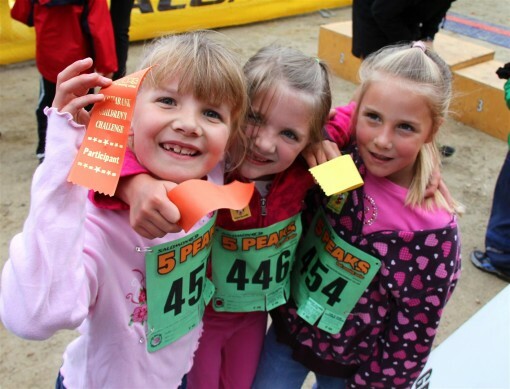 But before my brothers, my nephew, and I ran a few of my nieces did the kid’s race (1k) and did absolutely awesome! I have such sporty (and beautiful!) nieces. I’ve done a few road races from a 5k to a marathon and let me tell you, trail runs are no joke. I’m used to running on flat, smooth surfaces with very little incline (I live in the prairies). The trail run was muddy, uneven, and very hilly – more than hilly really. I swear I was climbing up cliffs for some of them. There was a 14k and a 7k, so those of us who did the 14k had to run the lap twice. The first lap was horrible. I got the worst cramps I’ve ever had – they started in both sides of my neck, then going through my shoulder to my arms. Every move made it worse. I’m no wimp, but I was actually tearing up with the pain. I also have a knee injury where the knee doesn’t track properly and it isn’t in place, so that was bothering me as well. I was really dreading the second lap. However, thankfully the cramps dissipated a bit and I was able to run the second half with less pain and run it faster than the first lap. Aside from hoping I’d be less than 2 hours, I didn’t really have any goals for the run, but I did decide to really take advantage of every hill I ran down. I have long legs so that’s when I would pass people (doesn’t matter that they passed me on the way up the next hill, haha!). You know it’s kind of fun to get to know all the people in these runs. We talk about how nasty our injuries are, how they just started running, or how they just had a couple hours of sleep the night before, or that they should’ve clipped their toenails and now they’re limping – yup, those are my homies. Me and the peeps near the back. Normally races don’t leave me emotional, but after this one I felt really spent. 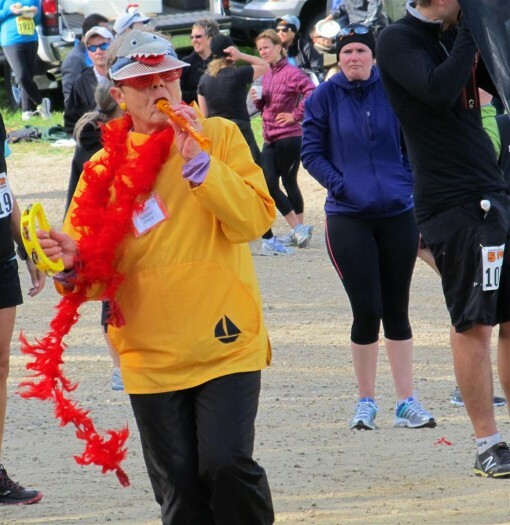 I sprinted to the finish line and literally fell into this lady’s arms. Bless her heart. I’m not the fastest runner at all (my time was 1:49), but I was happy with that. My brother and his son ran the 7k and both of them did awesome! My other brother ran the 14k and he was second in his division! He did it in 1:26, what can I say…he’s such a beast. I actually won second in my category, which was actually a weight category (had no idea races did this!). First and third didn’t show up (probably because they didn’t want to admit they were in that category, ha). However, because I’m freaky tall, I fit in the category and got a medal. I’ll take it! I was starving since my breakfast was almost non-existent (I don’t like eating much before I run), so post-race food tasted amazing! The watermelon tasted so good. All in all, it was really fun (especially when I stopped running). I can say that I’m a lot more comfortable doing road races, but I think it’s really important to do things out of your comfort zone and this race certainly did that for me! Have you done a trail run? What is something you’ve stepped out of your comfort zone for? Awesome job! Good for you for stepping out of your comfort zone! I have yet to do a trail run but did run my first 5k this past june! So very neat! You looked great sprinting to the finish! One of my bucket list goals is to run a trail run. Thanks for sharing! p.s. Congrats on your medal! Congrats! I’ve never ran a trail race! I can’t believe they group you by weight. Congrats on your race and your medal! Great job. Time doesn’t matter in a trail race. With hills to climb and rough terrain there is no way to say what is a good time. 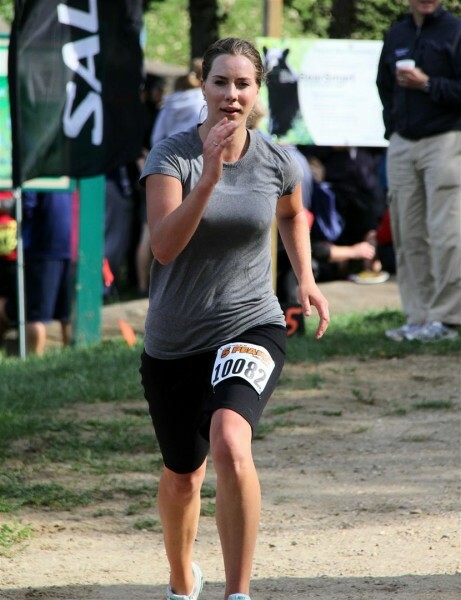 One of my favorite races was a 10 mile trail run called That Dam Run. Love that picture of you sprinting in.. Nicely done. Great pics! I’ve never done a trail race but love trail running. I can see how it would be difficult. yoga has been my latest trip out of the zone of COMFU!!! Cramping is definitely no fun but YOU DID IT! Wooo Hoo! CONGRATS on a great race!!! Awesome pictures too! This is awesome. Way to go and congrats!! I have only run one trail run but hope to implement more in the future. Hope you do too! That sounds so fun! I still have it on my bucket list to do a trail run too, unfortunately there aren’t many around here. Great job- looks like an awesome experience, and definitely challenging! Nicely done! I love trail runs much better than standard road runs. It could be a mental thing but they just seem to go by so much quicker and easier! YOU ARE A ROCK STAR! Congrats on EVERYTHING. Here is a tip, if you can’t see the top of the hill or incline, don’t be afraid to walk it. 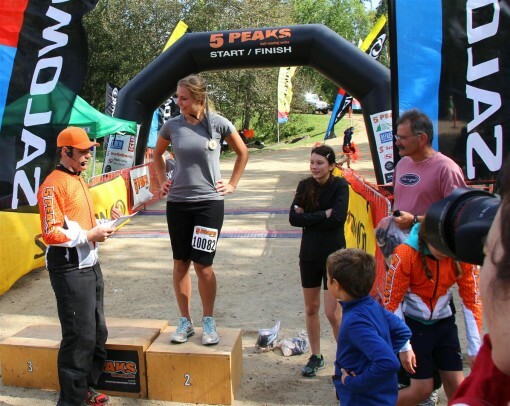 Trail races are notorious for brutal ups AND downs. But it’s so peaceful out there. Wow Charissa. Very Impressive! I enjoyed your comments and the pictures, especially since I know all the family. I wish I could be in such good shape!! You are lookin’ good girl!! Congrats on the medal! !